This morning the lake resembled a sheet of glass ~ or more like a mirror with the perfect reflection of the long needled pine trees, the various selection of docks and the unique rock formations native to the Severn waterways. Perfect for a kayak ride. 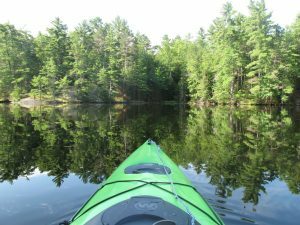 So, with my paddle in hand, I headed out for a morning journey through the channel ~ swiftly at times, concentrating on the angle of the paddle and the rhythmic shifting from side to side and slowly at other times enjoying the beauty of the view that one can only truly appreciate from being directly on the water. I had brought my camera for those “just in case” moments and the stillness of the water afforded me the opportunity to capture a few shots, without the fear of tipping. 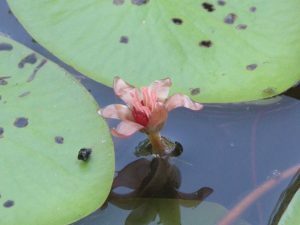 Two hours later, as I neared the cottage, and started to brace myself for the docking procedure (still my least favourite part of the kayaking experience), I decided to loop to the other side of the peninsula and check out our one white water lily. I’m not sure why we only have one lily ~ there is a multitude of lily pads ~ but just one lone lily. None the less, the conditions were perfect for a water level picture of the lily so onward I ventured. 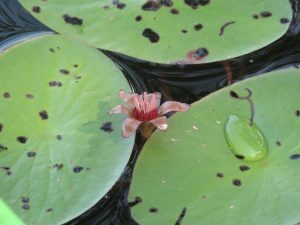 In order to get to the lone lily, I needed to paddle through what I had always thought of as a layer of just leaves. Most of the leaves had various brown spots, making them look as if they were diseased in some way. These leaves cover most of the surface area within our little bay and to be honest I hadn’t given them much thought. But as I slowed down and angled the kayak towards the lonely lily, I noticed something popping up beside one of the “diseased” leaves. As I got closer, I saw a beautiful, delicate and intricate red flower. Upon further investigation it became apparent that the whole bay was filled with a sea of these flowers ~ flowers that were unnoticeable from the shoreline. With the help of the zoom feature on the camera, it quickly became apparent that the little red flowers were even more striking than the single white lily which was my initial quest. Later that night, as I reviewed the pictures on my camera, I couldn’t help but wonder if we, as educators, sometimes miss the beauty of the smaller more notable things on our quest for the big significant things. How many small red flowers do we miss in our quest for the white lilies? Have we become so focused on the big picture prizes ~ such as EQAO ~ that we’ve forgotten to get in the water and notice the multitude of smaller, more notable, more delicate and more bountiful prizes. Those day to day examples of learning, curiosity, questions and “aha” moments need to be experienced while we are in the “water” with our students. Anyone can see the white lilies from the shoreline. You can count them and even predict when they will be in full bloom and when they will close for the evening and rest. But if we truly want to understand the landscape ~ or in this case the ecosystem of the bay ~ then we can’t stay on the shore. And just like truly taking part in student learning, we need to get in the water (which includes the excitement and sometimes fear of the launch and the docking) and look beyond the “diseased” leaves to experience the beauty. What have you been pleasantly surprised by, when you “got into the water” and learned alongside of your students?